Why is one blade better than five? What safety razor is best for sensitive skin? How do you condition a strop? What is the difference between aftershave splash and balm? What is a good straight razor for a beginner? Is shaving soap better than shaving cream? How many shaves can you get from a DE blade? Why do you use an aftershave? I have been experiencing a lot of redness after my shaves. Do I need a more aggressive razor or a sharper blade? How do you get a good lather with a shaving soap? What is the lifespan of a Merkur safety razor? Is a Shavette a good alternative to a traditional straight razor? What order should I use my blade sampler pack? How do you strop a straight razor? What is the numbering system used on the blades? How to store DE razors? Can I use regular soap as shaving soap? Is a heavier razor better than a lighter one? What is the safest method of blade disposal? What should be in a “wet shaving starter kit”? How do you apply splash-based aftershave? Do I have to buy a stand for a shaving brush? What is the adjustment scale for a safety razor? Why are vintage Gillette razors so popular? Would you suggest the same safety razors for beginner ladies as you would for men? What is the best Trumper’s shaving cream? How long does a puck of shaving soap last? Can I use shaving soap without a brush? Do I have to use a Feather blade in my Feather All Stainless Safety Razor? Do you ever use the boar or synthetic shaving brushes? Why doesn’t soap lather in hard water? How many shaving passes do you do? Is it still considered traditional shaving if I use a cartridge razor? Do people actually use the Wee Scot? When do you use Skin Food? Injector and Gem blades are at the drugstore, but how can I find a razor? Can the regular use of a pre-shave oil coat your shaving brush with a layer of oil that would potentially damage it? The cartridge razor system is appealing to many men because it is advertised to be modern and high performing with innovative designs and multi-blade cutting action. High-dollar marketing campaigns feature celebrity athletes that promote modern cartridges as the only masculine option. The problem is that the blades of a cartridge are close together with extremely small spacing between each cutting edge. The razor is unable to cleanly cut hair without requiring multiple passes along your skin, catching and pulling long stubble, as well as constantly clogging during the shave. The double edge safety razor, on the other hand, uses a single cutting edge that tracks along the skin at a much more comfortable angle and cuts the hair cleanly without grabbing or pulling excessively (provided you choose the right blade for your beard and skin type). Although you won’t find many celebrity athletes promoting the double edge razor, there has been a strong resurgence in traditional shaving. Many men are returning to old-school shaving because it is more comfortable and more economical. Building a lather can be done in a bowl, in your hand, or on your face. Many users of shaving soaps prefer to lather directly on their faces because it’s easier to load a wet brush with soap by buffing it against the puck and then building the lather directly on the face. On the contrary, shaving creams tend to work best in bowls because you can more easily control the amount of water that you are adding to the cream. You don’t want to lather inside your shaving cream tub since that will make all of your cream runny and you’ll use a lot more cream than you’ll actually need for one shave. Or, as an alternative to a bowl, I’ve found that using the palm of my hand is a great way to lather creams, especially those that are very dense in texture. Dense creams are often difficult to lather in a bowl because it can swirl around the perimeter of the bowl, whereas in my hand it loads nicely into the brush to form a usable lather. In my experience, almost all new wetshavers believe that they have thick beards and sensitive skin. The truth is, however, that most men are in the middle and a medium aggressive razor, such as a 34C or DE89L, is the best place to start so that you can learn the proper angle and pressure to use when shaving. Also, a new wetshaver can use these razors to experiment with different brands of blades because in these razors a Derby will be mild and a Feather will be sharp so you can use these to learn where your beard type falls on the continuum. Those who are new to wet shaving should avoid adjustable razors because many men have a tendency to experiment with different dial positions and may end up in an endless cycle of confusion and skin irritation. Start with a quality fixed-head medium-aggressive razor and you will be surprised to see how your shave is more enjoyable. For experienced wetshavers that have sensitive skin, there are many models that provide good results, including the medium aggressive fixed-head razors mentioned above. In addition, the stainless steel double-edge razors from iKon and Feather have small blade gaps that expose only a small amount of the blade’s edge. You could also try a quality adjustable safety razor, such as the Futur or Progress, on the lowest blade exposure settings. Conditioning a strop is much simpler than most people think. The natural oils from your hands are enough to keep an undamaged strop in fine shape. Simply rub the strop back and forth with your palm and your skin’s oil will help your strop remain nice and supple. I usually do it daily after each use, but it is not necessary. You won’t see a difference in the color of the strop, but the oils from your skin will keep the leather soft and conditioned. If you have a heavily worn antique strop that hasn’t seen the light of day for decades, then a neatsfoot oil treatment may be in order. Start with very little and rub it in with your palm, adding a tiny bit at a time as needed. Let the strop dry at least overnight before you begin to use the strop again. The slant razor, such as the Merkur 37C, is different from regular safety razors because of the unique design of the cutting head. Rather than the safety bar running perpendicular to the handle of the razor, the bar of the 37C bends the blade at an angle. The purpose of this design is to create a slicing action with the blade when you shave with it. This allows the edge the of the blade to cut closer and more aggressively than a standard double edge razor, making the slant razor a very popular choice among experienced wet shavers and men with very thick and coarse beards. Because the slant is known to be aggressive, it is generally considered an advanced tool for those who are already accustomed to wet shaving and should be avoided by new shavers, who have yet to become completely familiar with the use of traditional safety razors. With the correct technique and pressure the slant, paired with a quality blade such as a Feather, is capable of producing extremely close and comfortable shaves with fewer required passes. Aftershave splash contains alcohol that works as an antiseptic to keep any cuts from becoming infected. It also works as a toner to close pores and tighten the skin. Typically aftershave splash has a stronger fragrance, which appeals to men who want a subtle scent without using cologne. Many men avoid an aftershave because they worry that it may itch or burn; however, irritation can be avoided by choosing an aftershave balm, which has no alcohol. Aftershave balm is especially beneficial to those who suffer from dry skin or razor bumps because it hydrates and soothes the skin. The balm has a more subtle fragrance than a splash, so it is less likely to conflict with cologne. It is also preferred by men who prefer to avoid fragrances on their faces. Several respected manufacturers, such as Dovo and Thiers-Issard, produce quality straight razors that are commonly available. Beginners to straight shaving should purchase a new razor rather than vintage until you have experience identifying a quality razor, and it is critical that your new razor is shave-ready, which means it has been professionally honed. Straight razors are priced by the grade of the steel, size/shape of the blade, and materials of the scale. For a first razor, set your budget at around $125, so that you are not out a great deal of money if you do not like straight shaving. A beginner should choose a 5/8 inch width razor, which is a size that is comfortable to hold and maneuver for most people, as you learn the basics and become more comfortable shaving with the best straight razor. Strop your razor prior to every shave in order to keep a straight edge, and store your razor in an area free from humidity and moisture. There are two important factors you should examine when you are buying a safety razor. First, look at the size of the handle and the overall weight of the razor. You want a razor that is not too heavy in either the top or the handle so that it is off-balance in your hand. A well-designed razor should feel comfortable in your hand and be easy to hold and maneuver around your face at the proper cutting angle. If the razor is too light, you could have a natural tendency to apply too much pressure and cut your skin; if it’s too heavy, you may inadvertently apply too much pressure due to the weight of the razor. Second, look at the top and make sure that there is equal blade exposure on both sides of the cutting head. In other words, make sure the gap between the blade and the safety bar is even and consistent on both sides. Some razors may vary from model to model how much gap is present, but they should always be equal on both sides. Frequently inexpensive razors can have uneven gaps, which increases your likelihood of cutting your skin during your shave. Quality razors from reputable manufacturers, such as Merkur or Edwin Jagger, have quality controls in place to ensure that the cutting head is symmetrical and razors are made to precise standards. Pre-shave oil is designed to give your skin an added layer of protection prior to applying a shaving soap or cream lather. The additional benefits of pre-shave oil are that it moisturizes the skin and protects your skin from razor burn or irritation. Using a pre-shave oil is optional; some men use it frequently while others feel it does not enhance their shaves. I use pre-shave oil on occasion, especially when I’m traveling and I am unsure of the water quality and its effects on my skin. If you choose to use a pre-shave oil look for one that is made with all-natural ingredients (so-called organic pre-shave), preferably with a thin consistency. Thicker oils tend to clog the razor and can be difficult to rinse from your skin. To properly apply a pre-shave oil, thoroughly rinse your face with warm water and apply a few drops of oil to the palm of your hand. Rub your palms together and gently massage the oil onto your face. The goal is to get very thin coverage across your entire shaving area. Allow the oil to set on your skin for at least a minute during which time you can wash the remaining oil off your hands. Apply your soap or cream lather to your face and proceed to shave as normal. The difference between soap and cream is mostly a personal choice since both produce a usable lather. Typically soaps offer a little more slickness, which many straight shavers prefer, while creams offer a little more protection, which is preferred by some DE shavers. In the end, though, you can use a soap or cream with any shave method. It comes down to which you happen to like more for your own personal use. Unfortunately, there is no definitive answer on how many shaves you can get from a double-edged blade. Each brand of the blade varies somewhat in sharpness and edge durability, and each person’s hair growth varies in density and coarseness. I usually use a blade for 3 shaves before I toss it into the blade bank and load a new blade into my razor because (1) I keep several packs on hand, and (2) I want to ensure that my blade is very sharp every time. Popular blades, such as Feather and BIC, generally perform very well and can give the average person 5-7 shaves with each blade. Some men can use the same blade even longer if they don’t have coarse beards that can wear the blade edge down quickly, or if they want to really stretch their dollar. Several retailers offer multipacks or blade samplers that can offer you an assortment of blades to see how different brands affect your shave. No matter which blade you choose, you’ll still find the DE blades to be much more economical than cartridge razors. Using a shaving brush helps to exfoliate the skin before shaving by buffing off dead skin cells that could hinder you from getting a clean, closer shave. Then, as you shave, the razor glides over your skin and gently exfoliates even more. Aftershave is very important to nourish the skin after you just removed the dead cells and exposed a softer layer of skin. An aftershave splash will cleanse and tighten the skin, or an aftershave balm will moisturize and soothe the skin. Assuming that your face is properly prepared and your lather is right, there are some indicators to help answer this question. If during your shave it feels like the razor blade is not making contact with your hair or you have to go over the same area several times, then the razor is too mild for you. If you feel that the blade is making contact with the hair, but it is tugging or pulling and you have to apply more force to move the blade along, then you need a sharper blade. If your razor blade removes a lot of hair in one pass and you feel that the blade is scratching across your skin, then the razor is too aggressive for you. If you feel burning or scratching in your final passes due to the friction of the blade on the skin or your aftershave burns your face excessively, your blade is too sharp. In my experience, almost all new wetshavers believe that they have thick beards and sensitive skin. The truth is, however, that most men are in the middle and a medium aggressive razor, such as a 34C or DE89L, is the best place to start to experiment with different brands of blades. In these razors, a Derby will be mild and a Feather will be sharp so you can use these to learn where your beard type falls on the continuum. Later you can experiment with other combinations of razors and blades. For example, you could try a mild razor like a Feather All Stainless or iKon Bulldog (regular comb), where the blade gap may not expose enough blade so you may need a BIC or Feather blade to cut through your stubble. Or you could try a Derby in your Merkur Slant, to test if the guillotine slicing provides a good combination of cutting the hair with a blade that will not be too harsh on the skin. There is a balancing act that happens between a safety razor and a double-edged blade. The goal is to find the right combination for your skin/hair types so that you have the blade sharpness necessary to effectively cut your stubble and the cutting head/safety bar that will keep the blade from irritating your skin. Every shaving soap is a little different in how it lathers. Some soaps are quite hard and a slightly different technique needs to be applied. For difficult-to-lather soaps, use the Load/Hydrate Technique that breaks the process down to two steps: (1) load brush then (2) add water. First soak the brush thoroughly and shake out most of the water. This leaves the brush damp, but not loaded with water. Work the brush on the soap to get it loaded with product, even though you won’t start to see creamy lather yet. At this point, it will be a bit dry looking and sticky on the end of the bristles, but this allows the soap to break down into the brush. Once you’ve got a good bit of soap loaded up, dip the end of the brush tips in hot water to hydrate it more, then proceed to try to create a lather. Depending on your brush grade and the hardness of your water you may have to experiment by lightly dipping the brush into the water a few more times. However, you’ll notice that the soap will quickly build into the creamy lather that you are looking for. Merkur safety razors are among the best-made razors available on the market today. These razors are well constructed of solid steel and plated with either chrome or gold, with the exception of a few special edition razors produced occasionally. These razors are quality tools capable of lasting decades of daily use. To ensure your razor’s longevity, thoroughly clean your razor after every use. This protects the plating from being damaged by rust and keeps your razor looking good. Even if your plating becomes damaged, your Merkur razor can be restored. A Merkur safety razor is a $40 – $60 investment that can likely last a lifetime. Disposable blade straight razors, such as Dovo’s popular “Shavette” model, are very commonly used in the barbering profession due to the ability to easily change the blade between customers. This allows them to be more hygienic in addition to the convenience of not having to maintain the cutting edge and strop the blade for every shave. They range in price and quality from inexpensive models such as those offered by Dovo and Parker to the more luxury class models such as the Feather Artist Club. These razors typically use a special size blade or a standard double edge blade broken in half, which is held in a secure holder during the shave. Many new shavers are attracted to these razors because they mimic the style of cutting with a straight without the time or expense that goes into honing and stropping the razor; however, most lack the weight and balance of a real solid steel straight razor. In addition, the blade is very thin and the lack of balance can create problems when cutting with an extremely thin blade that has no safety guard that a standard double edge safety razor provides. Most newcomers to straight shaving would be better off purchasing a true straight razor and using it to master the technique of shaving with it. Although the straight razor can be intimidating at first, taking the time to learn how to shave and maintain your razor can be very rewarding experiences for a traditional wet shaver. Once you have experience straight shaving, however, disposable blade straight razors are worth trying because they can provide a good close shave and are especially useful on occasions where you are short on time or are away from home and do not want to have to carry a strop with you. One of the best ways to determine which DE blade is best for your skin type and beard texture is to purchase a sampler pack so that you can try several different brands. Several online retailers offer sampler packs, such as the DE Multipack from Lee’s Razors. Many men falsely assume the sharper blades are best, but it is possible that a blade may be too aggressive for you and cause unwanted irritation and nicks. When you receive your sampler pack, start with a mild blade, such as a Derby. These blades work well for most men and are more forgiving if you are new to traditional shaving. Next, try a Merkur and see how this brand works for you. The right blade will glide smoothly over your skin and provide a close and comfortable shave. If you feel tugging or pulling, then try a Red Personna blade. If you find these blades comfortable and you want to try the sharpest blades in your sampler pack, you can step up to a Feather blade. The fine edge of the Feather benefits men with dense beards or wire and coarse whiskers. This popular blade provides a very close shave; however, if your skin is sore or swollen, or your aftershave burns excessively after using Red Personna or Feather blades, then you know that a milder blade is a better choice for you. The number of shaves you get from a double edge blade depends on the quality of the blade and the coarseness of your beard. A good sharp blade should glide easily across your face and cut the hair uniformly. After using a blade for several shaves, the quality of the edge will start to wear down. When this happens the blade will start to tug or pull against the beard stubble. This is most noticeable on passes across or against your beard grain because your skin is more sensitive to irritation when shaving in those directions. As you glide the razor across your face, you may notice some discomfort and the need to apply more force to move the blade along. You will also notice that more patches of stubble get left behind when the blade is not tracking along the skin uniformly as it should be. This is usually combined with some uncomfortable soreness or sometimes burning sensation on the skin. Dulling blades are also more likely to cause nicks or cuts as well. Fortunately, the soreness and irritation can be relieved by thoroughly rinsing the face and applying a quality aftershave splash or balm. When these symptoms occur, it is a good indication that it is time to change the blade. If this happens with a new blade, chances are you either have a blade with a defective edge or should consider trying another brand that may be more compatible with your skin or beard type. First, it is important to clarify that stropping is not the same as sharpening, which is called “honing” and is done using a wet stone. Before using a straight razor, it must be sharpened to be shave ready and then be honed every few months. Stropping is done before every shave to align the edge of the blade so that the steel is pointing in the same direction and you have a straight, clean edge. To strop a razor, you move the straight razor’s edge forward and back against a razor strop. Simply attach one end of the strop to an immovable object, like a towel bar or bedpost, and pull the other end taut. Using light pressure, run the blade horizontally (spine first) up the leather surface with the blade flat against the leather. At the end of the stroke, flip the blade over and run the blade horizontally back down the strop. It is recommended to do this about 40-60 times. 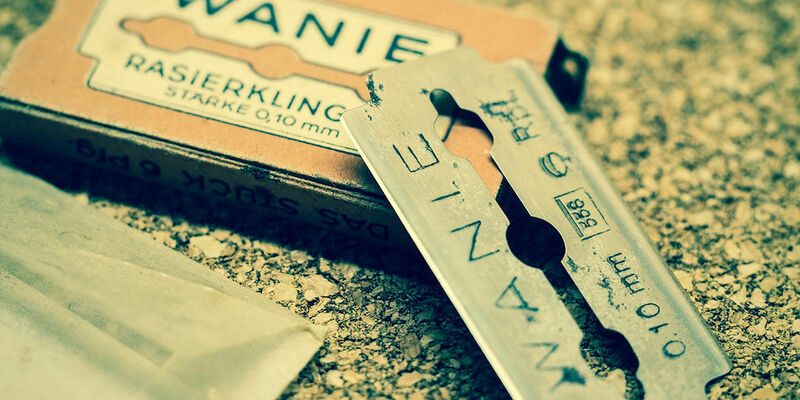 Some brands of razor blades stamp the blades so that if there is a quality control concern during the manufacturing process there is a way to identify the sides of the blade. Usually, the blade has “1 2” on one side and “3 4” on the other. People frequently ask if the numbers are to designate a side that is better for shaving, but both sides are the same in that regard. Some men use the numbers for keeping track of the edge that they most recently used during their shave. The argument is that flipping the blade in the razor between shaves allows the edge to be worn down more evenly. However, most people just ignore the numbers and enjoy their shaves as usual. Storing DE razors is very simple. Most razors have a plating finish that is resistant to rust or corrosion as long as they are rinsed and dried between uses. Some of the high-end razors, such as the PILS and Feather, are constructed of stainless steel, which is even more resistant to rust. Unlike straight razors, humidity is not as much of a worry with a safety razor. Keeping your razor on a stand or rack in your bathroom will not put it in any danger. Men with collections of razors often use items, such as pipe racks or jewelry trays, to proudly display their DE razors. Mine are kept in a simple toothbrush holder and on a couple of razor/shaving brush stands. The most important aspect of storing safety razors is to make sure they are clean and dry after you finish shaving. Thoroughly rinse the cutting head to wash away any leftover soap or cream, and use a dry towel to get any leftover water off of the exterior body of the razor. If you use the same razor every day, it is generally not a problem to leave the blade in the cutting head between shaves. If you have several razors that you use in a rotation; however, it is a good idea to remove the blade after using the razor. Double edge blades will rust and if left in the razor can cause rust stains to form on the inside of the cutting head and damage the finish. It is also recommended to completely disassemble the razor every few weeks and do a thorough cleaning of the inside of the cutting head and any corners or joints of the razor body to prevent small deposits of soap or cream that get missed during daily rinsing from building up. A toothbrush and dish soap does a great job at getting into the hard-to-reach crevices of the razor. Once your razor has been cleaned, dry it and store it as usual. By taking a little extra care with keeping your DE razor maintained, your investment will always look great and provide you many years of service. According to the FDA, which regulates product labeling in the U.S., “There are no regulations or requirements under current United States law that require cosmetic manufacturers to print expiration dates on the labels of cosmetic products.” The European Union’s Cosmetic Directive requires expiration dating only for products whose “minimum durability” is less than 30 months. Many professional organizers advise replacing shaving products every 2 years; however, high-quality wet shaving products are useable years beyond that time frame if stored properly. “All natural” shaving products may have a shorter shelf life because they have fewer preservatives, and they may have plant-derived substances conducive to microbial growth. Use common sense when evaluating your shaving soaps and cream by looking for changes in color or scent. While all soaps can lather, shaving soaps are specifically formulated to produce a thicker and creamier lather that is both lubricating and moisturizing. Shaving soaps contain certain base oils that create a protective lather that allows a razor blade to glide across without friction that can damage the sensitive skin of the face and neck. In addition, shaving soap is designed to maintain its thickness for enough time as it takes a person to shave without drying down. Body and hand soaps usually produce a thinner lather that collapses and dries down quickly. Furthermore, many bath soaps contain antibacterial ingredients or drying agents that are not designed for the face. There are some luxury bath soaps, such as those from Rancé and Santa Maria Novella, that create very rich lather that can be used for shaving; however, these are the exceptions rather than the rule. Most men prefer to use soap specifically created and marketed as Shaving Soap for the rich protective lather and moisturizing properties it offers. A great shave can be achieved by both heavy and lighter razors and it becomes mostly a choice of personal taste. Some people prefer a heavier safety razor and they let the weight do the work for them to keep extra pressure off the skin, while others prefer a lighter razor to have a little bit more control. A lighter razor is sometimes easier to maneuver on tough spots, such as around the jawline, while a heavier razor can feel sluggish in the fine turns and harder to fit under the noses of some. No matter which you prefer, it’s best to ensure that the razor is evenly weighted. In other words, you don’t want the cutting head alone to be the bulk of the weight nor the handle alone be the heaviest part. You want the razor to feel comfortable in your hand and evenly balanced despite its overall weight. The best and safest way to dispose of your used blades is to use a blade bank. Several online retailers offer them for purchase or complimentary with a blade order. These inexpensive tin canisters have a slit cut in the top so you can drop in old blades for safe keeping. Some men use a coffee can or other holder, but I prefer the blade banks because they are small and inconspicuous among my shaving supplies. Plus, when the bank is full (which takes a long time because it holds a lot of blades) I take a hammer and pound it flat so that no blades can fall out in the trash. Using a blade bank gives me peace of mind that my children and pets are safe from discarded razor blades. Anew wetshaver’s starter kit should include a quality safety razor, a basic shaving brush, a shaving soap or cream, aftershave balm, and a nick stick. For a first razor select a fixed-head model from Edwin Jagger or Merkur, and look for a medium-sized shaving brush. The ideal brushes for beginners are usually pure or best grade badger because the hair is durable and affordable. When choosing a soap or cream, start with a scent that appeals to you from a reputable brand, such as D.R. Harris, Trumpers, etc. There are many low-cost and artisan products out there — some of which are very well made — but the reputable brands provide consistently good results so that you can learn how to shave properly with your new tools. As you adjust to shaving in a different way, it is also likely that you will experience some irritation or nicks at some point, so select a good nonalcohol aftershave balm. This will provide the most comfortable and soothing relief, unlike an aftershave splash that can sting if your skin has any irritation from shaving. Also, grab a Pacific Nick Stick for stopping any small nicks or cuts. This product is not only very affordable, but it will also stop any bleeding quickly. A starter kit should be kept simple so that you can focus on learning how to wet shave and enjoying the process. Plus, if you damage a brush or decide that wet shaving is not for you, there is not a significant loss of investment. Most traditional aftershave splashes contain a significant amount of alcohol. As a result, when applied to the face after shaving there is usually an intense stinging sensation that many men find uncomfortable. The simplest way to apply traditional aftershave and minimize the stinging is to thoroughly rinse your face with cold water after shaving, which helps clean the face as well as close pores on the skin. Then leave your face wet and pour the aftershave splash into your hand. You’ll add about a teaspoon worth of aftershave into the open palm of your hand. Quickly rub your hands together for 1-2 seconds, and leave your hands open for about 4-5 seconds. Doing so allows a large portion of the alcohol to evaporate from the aftershave. Then in a downward motion, gently stroke the aftershave from your hands onto your face and neck. Applying splash aftershave this way minimizes the stinging from the alcohol and maximizes the fragrance and soothing oils of the aftershave. Hanging your shaving brush on a stand is not necessary if your brush has a flat base and can balance on the handle. I have over 60 brushes in my collection and they are displayed on shelving in this way. I do have a stand that I use when my brush is wet after my shave. Many men simply place their wet shaving brush back on their shelf immediately after their shave; however, I prefer to hang my wet brush on a stand to dry throughout the day. This gives me confidence that no water is pooled in the handle and the inner core of the knot can be completely dry. In addition, gravity helps the bristles dry straight instead of the bowed shape caused by the weight of remaining water in the badger hair. Some manufacturers recommend using a stand to dry your shaving brush while others say it is not required. While buying one is an added expense that is not absolutely necessary, a stand is an attractive accessory that is useful for drying and storing your first (or 20th, or favorite, or wet) shaving brush. Just because you’re traveling doesn’t mean that you can’t enjoy a good shave away from home. If you travel frequently one option is to purchase a travel-style safety razor that disassembles and can be stored conveniently in a small leather pouch. Merkur produces a quality travel razor in both open comb and regular comb variations. Another option is to browse shaving retailers that offer handy leather zipper pouches that will hold a full-sized double-edge razor, and some also include storage for your brush as well. If you don’t want to invest in a travel case for your safety razor, you could easily roll it up in a hand towel or washcloth so that it doesn’t roll around in your toiletry bag. If you are traveling by air, be aware that TSA guidelines will allow you to carry on your safety razor; however, you cannot have a blade loaded in the razor or in your carry-on baggage. Keep your razor blades tucked away in your checked baggage or purchase a pack of blades when you arrive at your destination. Adjustable safety razors are identified by a range of numbers printed on a dial or around the handle. The range can vary for each style and/or brand (e.g., some razors show 1-9, 1-8, 1-6, 1-5, or another range), so there is not a standard millimeter increase for each click across all razors. By turning the knob or handle, the user can raise and lower the cutting head to create a larger or smaller blade gap. When a safety razor set at 1, it will have the smallest blade gap, so that less of the double-edged blade is exposed. Those with sensitive skin or lighter hair may prefer this lower setting so that they can have a less aggressive shave. When the dial is turned to a larger number in the range, the head of the razor will raise to create a larger gap, which exposes more of the blade. Men with thicker beards or coarser hair tend to prefer this setting because it is a more aggressive shave. Some popular adjustable safety razors include the Mergress and vintage Gillette models. When using an adjustable razor for the first time, start at 1 and gradually increase the blade exposure to find the intensity that works for your skin type and beard density. Beginners to traditional shaving may spend more time tinkering with the adjustment dial than learning the appropriate pressure and cutting angle, so we recommend becoming proficient with fixed-head models before turning to adjustable safety razors. Vintage Gillette safety razors are the most significant icons of traditional wet shaving. King Gillette mass produced the first modern safety razors in 1904 and his razors dominated the market throughout the early and mid-20th century. Because of their high quality, there are many vintage razors still in existence that can be great shaving tools once they are cleaned and sanitized. The rising popularity of traditional wet shaving has increased the demand for vintage Gillette pieces because they are nostalgic — not only as pieces of American history but for many men they bring back memories of the razors that their fathers and grandfathers used to shave every morning. After sanitizing a quality find, some men take the extra step and have their vintage pieces completely restored with new plating, making the razor look just as nice as the day it left the Gillette factory decades ago. Although there are many vintage razors on today’s antique and auction websites, you will not find many vintage reviews on Mister Shaver because quality razors can be difficult to find and a buyer should have some experience with identifying a used razor to be able to properly assess its value. In my safety razor reviews, I prefer to focus on products that any new wet shaver can easily purchase in today’s retail market, even though there are beautiful vintage razors discovered every week. Unfortunately, there is not a lot of traditional wet shaving information for women; however, I have received several emails over the years from women readers of Mister Shaver, so I know that a good number of ladies out there have switched to using safety razors. The main obstacle is getting accustomed to the pressure and angle of the razor as you shave. This can be more of a challenge for women than for men because of the larger area you are working with when it comes to leg shaving as well as the difficult spots, such as the knee and ankle areas, where you also have limited view. Be sure to monitor your blade exposure that the blade is always at the proper angle despite changes in your skin’s contours. The biggest mistake is shaving with a safety razor as though it were a pivoting cartridge razor. I recommend the long handled Merkur 23C because the size and weight are similar to the ladies’ razors that Gillette produced many years ago. I know of other women that enjoy Merkur DEs and have even heard of a few that went as far as learning how to use a straight razor. Try a reputable brand like Merkur or iKon, and stick with a regular safety bar — avoid open combs, slants, etc. Experiment with a blade sampler so that you can find what works for you. Hopefully, with a little practice, you’ll enjoy shaving with your safety razor and achieve great results. My favorite Geo. F. Trumper shaving cream is the sandalwood fragrance. If you’re a frequent reader of Mister Shaver, this will not be a surprise to you, since sandalwood is one of my favorite fragrances, but there are three reasons why this particular cream from Trumper is the best. First, the scent is subtle compared to other Trumper creams and is not as overwhelming when you first unscrew the lid. Second, it has a neutral white color so you can tell that it does not contain large volumes of artificial dyes. Third, it provides a more protective lather than other creams from the brand. For example, Trumper’s Violet Shaving Cream is very dark purple in color and the Rose Shaving Cream is very dark pink. Both are heavily scented and can cause irritation for those with sensitive skin. Although these creams create a white lather, they can still cause irritation and in some cases even result in the color staining the tips of a shaving brush. Sometimes during my shaves, the lather from these products feels hot on my skin and leaves my face feeling rough afterward. The Extract of Limes Shaving Cream, too, is a medium green hue and the lather does not protect as well as the Sandalwood cream during the final passes. Trumper’s shaving creams are high-quality shaving creams that are easy to lather and provide great shaves for many people; however, many men with fragrance sensitivity or reactions to dye may find better results from Trumper’s Sandalwood Shaving Cream than others in the range. Shaving soaps are by far one of the most economical shaving items that money can buy. How long a puck of soap will last will vary from one brand to the next because not all soaps are made with the same ingredients. Shaving soaps fall into two categories: (1) glycerine-based soaps, and (2) hard soaps. Glycerine-based soaps are generally softer and will wear down more quickly than hard soaps. Glycerine soaps are usually inexpensive, which make them an attractive buy for many people. Most quality glycerine soaps, such as those made by Colonel Conk, can easily last up to 2 months of daily use. Hard soaps, on the other hand, are generally made of heavier oils, such as tallow or palm. They are generally much denser in texture and produce much higher quality lather than the cheaper glycerine-based soaps. A quality hard soap from producers such as Geo F. Trumper or D.R. Harris will last significantly longer than its glycerine counterparts. These soaps can easily last 4 to 6 months of daily use. Creating a good lather from a shaving soap would be very difficult to do without a brush. Shaving soap is cured and dry because of the way it is made. To convert its properties into a usable lather requires the soap to be infused with a significant amount of water. The shaving brush accomplishes this by scratching the surface of the soap with the bristles and mixing the soap with water. This creates a dense and cushioning lather needed for a comfortable shave. Attempting to lather a soap puck by hand without a brush would not accomplish this task and likely result in a thin and runny lather. If you don’t want to use a shaving brush, or are traveling and don’t want to carry one with you, there are many quality shaving creams on the market that produce rich lather without requiring a shaving brush. Although the Feather All Stainless comes packaged with 10 Feather blades, the razor can be used with any standard double-edge blade. The Feather Company from Japan produces what most wet shavers consider to be the highest quality and sharpest double-edge razor blades available today. The Feather All Stainless safety razor is made to the same high standard of quality and marketed to complement their well-known blades. Many men falsely believe that they need to use Feather blades to get the best shave; however, those with sensitive skin or lighter facial hair can experience issues with irritation from using blades that are too sharp. If you experience discomfort, burning, or scratching after shaving with a Feather blade, try a milder blade in your Feather All Stainless. Although badger hair is used for most of the shaving brushes on the market today, boar and synthetic brushes have many followers as well. I have found the boar shaving brush to be very useful with hard triple-milled soaps. The stiff and scratchier tips of the boar hairdo a great job at agitating the surface of the soap and quickly loading the brush with lather. Boar brushes also have a great scrubbing effect that is desired by men that like to build their lather directly on their faces and enjoy the exfoliating feel that a firmer brush provides. Boar hair is also much less expensive than badger hair grades so these brushes are an option for those seeking a cost-effective entry into traditional wet shaving. Synthetic brushes offer an alternative for men who prefer not to use animal products. They are available in a wide range of variations from basic nylon to specialized synthetic hairs that are tapered and colorized to mimic the look and feel of a traditional badger brush. Although the synthetic bristles do not have the natural water absorbing capabilities that animal hair provides, many of the quality ones on the market do a fine job at creating a usable lather. I have one inexpensive nylon bristle brush by Omega that has a firm feel to it and does well with both soaps and creams. I find it especially useful because I can use it on the morning that I am in a hurry without having to worry as much about shaving brush care as I would for the more delicate badger hairs. It is also useful in my travel kit because I don’t have to worry about it properly drying before putting it in my wet pack, and if it gets lost I’m only out $15. Hard water is water that has a large number of dissolved minerals, such as calcium and magnesium. When present in high concentrations, these minerals make lathering with soap very hard to do, which is how the term “hard water” actually originated. Soap is made from sodium byproducts, the result of combining fatty acids with lye during the saponification process, that easily bubble into a full lather when combined with pure water. When soap is combined with hard water, however, the minerals chemically react with the soap causing slimy and runny lather that is useless for shaving. Additional problems can arise from hard water as well. When hard water evaporates, it leaves behind deposits of minerals on your shaving brushes and razors. Over time hard water scale can damage the delicate hairs of a shaving brush and even make the bristles ineffective at creating suitable shaving lather. Besides being fun to collect, shaving brushes are critical for achieving an outstanding shave. First, the shaving brush infuses your shaving cream or soap with water, creating a richer lather than you could create with your fingers. Second, when you’re applying the lather to your face, you’re gently exfoliating your skin and removing dry cells so that your face is healthy and soft. Finally, a shaving brush helps to lift and soften the hair so that you can get the closest shave possible. I generally only require two passes: with the grain and against the grain. First, I wear a goatee, so I do not shave a portion of my face. Second, I shave almost every morning, including the weekends, my stubble never gets very long. And finally, my beard growth does not make me susceptible to ingrown hairs so I am fortunate that cutting against the grain has never caused me any discomfort. Most traditional wet shavers follow a basic three-pass technique for a proper shave. The goal of each pass is to incrementally reduce the length of the beard a bit at a time so that the shave is comfortable and free of irritation. By starting with the direction of the beard growth (referred to as “with the grain”), you can cut the hair when it is at its longest length without pulling uncomfortably. The next pass is done across the grain to get the stubble down to its shortest length while still avoiding pulling trying to shave too much off at once. For those that want to the smoothest shave possible, a final pass against the grain allows the blade to cut directly at the skin level leaving the face perfectly smooth and feeling no stubble at all. Some men with sensitive skin or that are prone to ingrown hair may avoid the third pass cutting against the grain because it can cause complications when the beard starts to grow back. In addition, many professional barbers also discourage men from shaving against the grain because it may be unnecessary for a presentable shave and too harsh on the skin for those prone to irritation. Although three passes are considered the standard approach, most men modify their routine based on their own beard density and skin sensitivity to find what works best for them. Traditional shaving usually involves the use of a double-edge safety razor or a straight razor; however, some men prefer the wide availability and familiarity of using a cartridge razor. Traditional shaving soaps and creams provide a suitable lather to shave with any type of blade that a shaver prefers. Regardless of the razor, the one critical component of traditional shaving is the use of a shaving brush. The shaving brush helps to create the perfect lather that exfoliates and conditions the skin, softens the hair, and allows for a closer shave — no matter which type of razor is chosen. Although the Wee Scot is tiny, its fan base is very large. This brush’s ratio of loft height to knot diameter is comparable to Simpsons’ popular Chubby model. This bristle density gives the brush a firm feel that works well for face lathering. It also allows for a cleaner shave, since you can put lather on an exact area of the face, without getting a lather up your nose and down your chest. The small loft also means that you use less product while shaving, even though this brush is a quality brush that can create enough lather for a three-pass shave. Interestingly, the Wee Scot is the only brush produced by the company that is stamped with Alexander Simpson’s own signature. The Wee Scot looks like a novelty shaving brush, but it is well loved by many men who use it on a daily basis. After finishing your regular shave passes, sometimes there are areas where a small patch of stubble still remains. Blade buffing is a useful finishing technique to get any last remaining spots of stubble. The key is to use very light pressure to avoid irritating the skin with short and quick strokes of the razor. Lightly shave the same spot over and over using very short, quick strokes to clear these trouble spots. Another term for blade buffing is spot cutting. Skin Food is a popular aftershave product offered by Geo. F. Trumper. It is available in three fragrances: Coral (a light rose scent), Extract of Limes, and Sandalwood. Skin Food is a smooth gel-like liquid primarily intended for use as an aftershave treatment. Its formulation of rose water and glycerin makes it well hydrating and nourishing without the sting of alcohol splashes or greasiness of thicker balms. Aside from its popularity as an aftershave, Skin Food is a versatile product that can be used as an effective pre-shave treatment as well. It is a good alternative to using pre-shave oil when it is applied to the face before lathering. Whether you choose to use it as a pre-shave, aftershave, or both, about a dime size amount is more than enough for an effective application. Pour a small dab of Skin Food into the palm of your hand, rub your hands together, and gently rub it onto your wet face in a downward motion. Unfortunately, injector razors are no longer produced despite their loyal following by many shavers. The same is true with the Gem razors, which use the single-edge blades you found at the drug store. If your timing is right, however, you can find them in antique markets and on eBay. When you purchase a vintage razor, you will have to clean and sanitize it, and some require more work than others. The razor’s condition usually dictates the price, which can vary widely. Some sellers are aware of the increased popularity of traditional shaving and are asking high prices, especially for the vintage Gillette double-edge safety razors. I found a vintage Schick Injector several years back at an antique store for $5.00, so deals can be found if you are willing to shop around. When the pre-shave oil is used properly, it would likely take quite a while before any negative effects on the shaving brush would be noticed. The most common mistake that wetshavers make with pre-shave oil is using too much of it for each shave. Pre-shave oil is best used in a very small amount, only enough needed to coat the very surface of the skin with a light amount of oil. Applying it in this manner prior to lathering with the brush would expose the bristles of the brush to a very small amount of the oil. However, if a heavy coat a pre-shave oil is applied prior to shaving, not only would it be more likely to gunk up the brush but it would also negate any of the lubricating and moisturizing properties of your favorite soap or cream.